Don’t throw that tired, old lamp away – turn it from trash to treasure with these easy recycling craft project techniques. 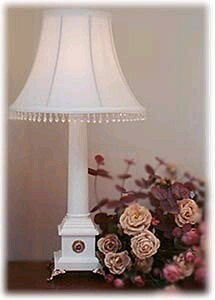 Gently sand the lamp base to remove dirt and create a little rough surface for the paint to adhere. Wipe away any dust particles and paint your base with white paint. Allow the paint to dry. You may need to apply a couple of coats of paint for complete coverage. Be sure to allow each coat to dry before applying the next. Using Super Glue or Household Goop (Goop is my preferred glue), attach the legs/feet as shown in photo. These feet are a little difficult to find. I removed these from an old jewelry box. Using cutters, cut the button loop off of the back of the button and glue the button in place as shown in photo. I used a store bought lamp shade. To add the beaded trim, hot glue the ribbon of the trim to the inside bottom of the shade. Use very little glue. Fabric Glue will also work for this if your shade is made of fabric.